There are usually no great views from caves, at least not of the sunset. Except at Rokokallio. 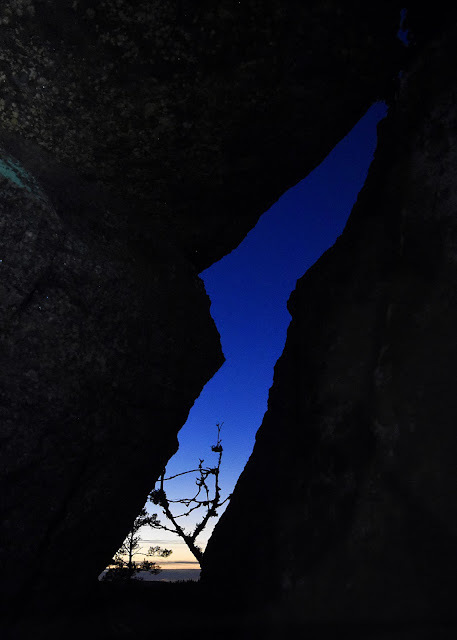 This cave consists of a crack on a rocky hill. You enter the crack from the top, but the crack ends on a cliff, opening up a small window overlooking the forests below. I happened to be in the cave just at the right time for a sunset, and the view was great! I often have difficulty in getting up early. 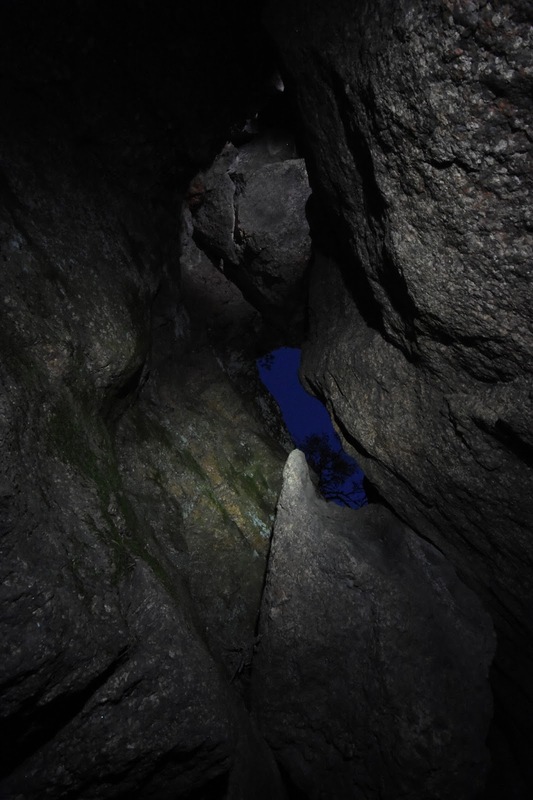 With the darkest time of the year, I did not manage to get to the cave before it started being dark. But on the positive side, I have found that dusk and night make for far more interesting visual experiences than plain daylight. But back to the cave. 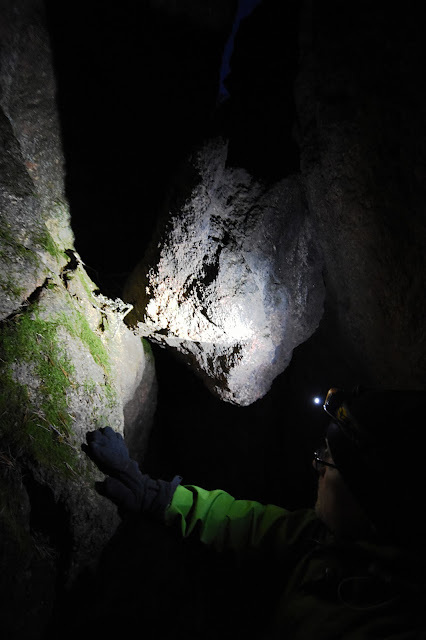 The caves in Finland are small, but this one is quite interesting. The crack itself is not long, maybe 10 meters. But it runs on multiple levels, and as you descend you'll discover new cracks further down. On this trip I was alone, so I didn't want to venture too far into the tightest places, missing at least one level at the bottom. 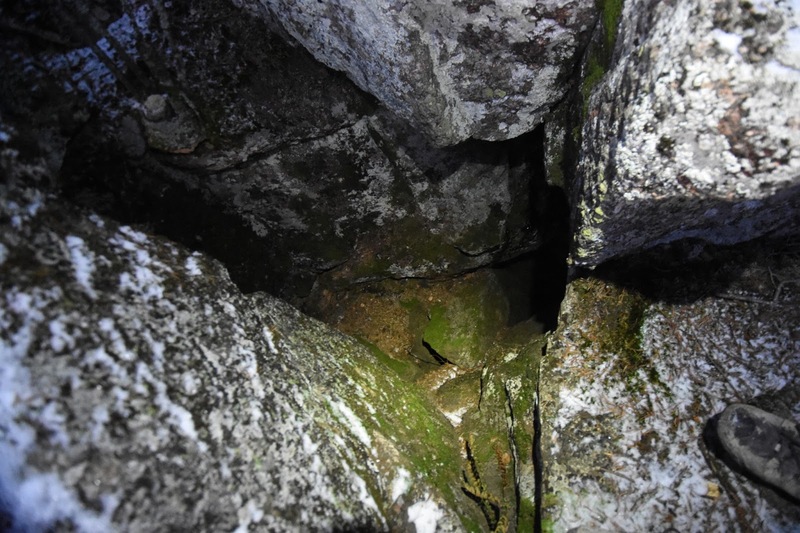 As a crack there are openings above as well, and this is how I first discovered the cave. 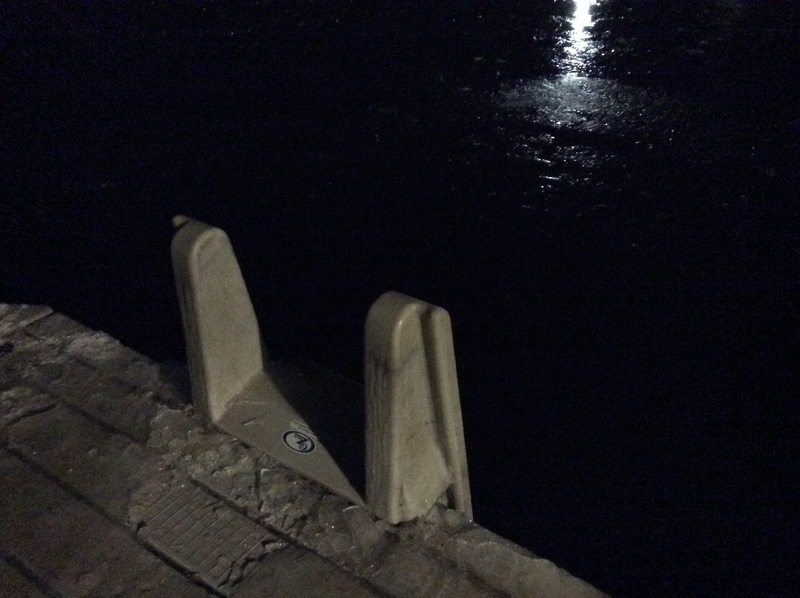 I noticed a crack that I didn't want to walk into. Entrance is through the side nearest to the cliff, and is relatively easy. You have to climb a little bit to get down and back up, however. Parts of the crack have a roof, or have rocks that are hanging between the walls. Beautiful green moss covers the upper walls. 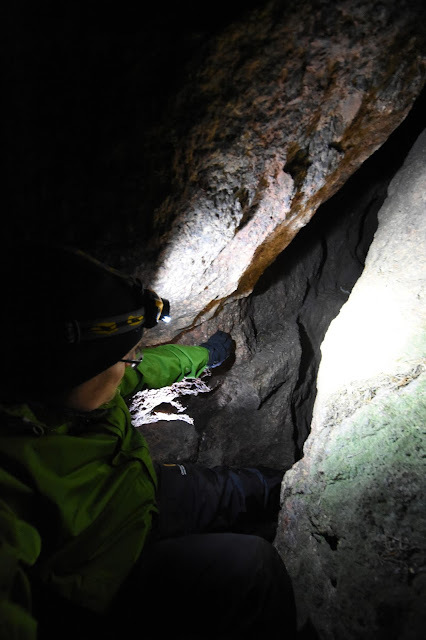 The bottom of the cave is dry and free of dirt, so it is fun to explore. 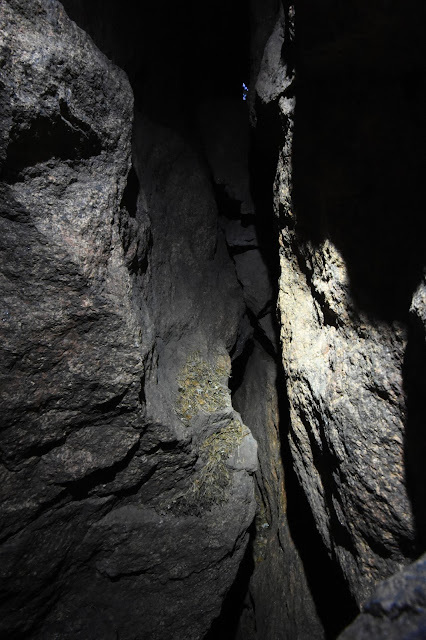 The area has multiple caves, however, and I only explored this one particular crack. Several roof slabs can be found underneath the cliff. It would be interesting to know if there's a path from the crack cave to the bottom. You can at least see light through, but at the lowest levels the crack gets very narrow. 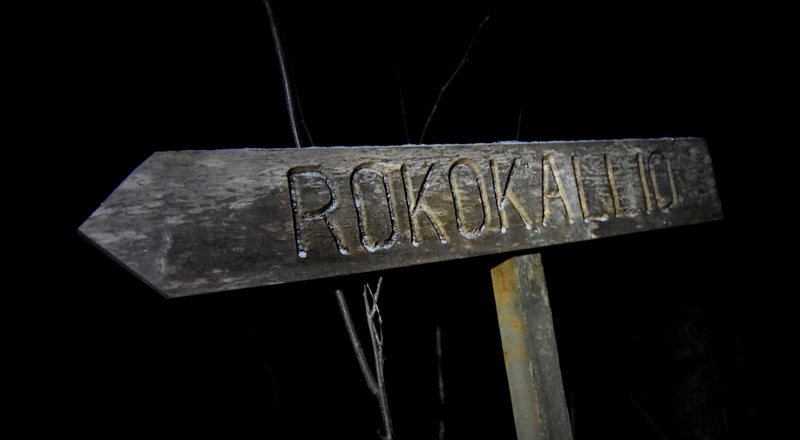 The Rokokallio area is well marked. Park your car at the northern parking lot on the Lustikullantie. A good map is visible here. The coordinates that I used for the cave are N 60°29'23.0" E 24°28'35.0" (WGS84). For more information about the cave, read this article. For some after-caving, I recommend the Kuusijärvi smoke saunas. For 10€ you get to visit a real smoke sauna, and dip into the lake before it gets too solid. It was my first time in cold water, and the first time in a public smoke sauna. Recommended! The sign on the pier prohibited sunbathing, however. It didn't say anything about moonbathing, however. Photos and videos (c) 2015 by Jari Arkko. This blog is also available in English from TGR. 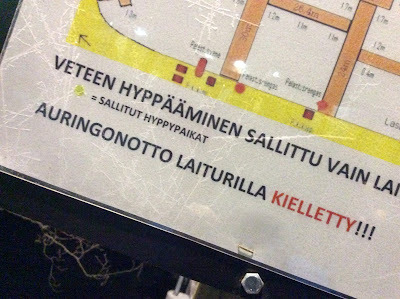 Tämä blogi löytyy myös suomeksi Relaasta.